Since we’re in the midst of “The Holidays,” I thought I would show you all a nice snow scene (as if we haven’t had enough so far this month on the East Coast). Now, I’m the first to admit that I really love the early American snow scenes of artists like Thomas Birch (1779-1851), George Durrie (1820-1863), and Thomas Doughty (1793-1856), but my favorite all time snow scenes are those of Ando Hiroshige. His snow scenes really give the viewer the sense of feeling the cold air and the smelling the fresh air of a winter snow. 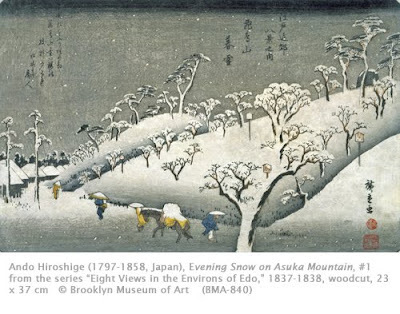 Some art historians have called Hiroshige the “master of snow and rain,” because he produced so many prints with artistically challenging weather conditions. We can only marvel at the skill of the wood block carvers of his period. Woodblock prints were known in the Far East since the 8th century CE. The medium was used for literary material, but the production of prints as stand-alone art was not explored until the Edo Period (1615-1858). The rise of an increasingly more prosperous urban middle class caused a demand for a cheap alternative to original paintings. Woodblock prints developed quickly for mass consumption, documenting everyday life in Japanese cities, changing from moment to moment with popular fashion. Because of the transience of fashion and artistic tastes in urban centers, the style is called Ukiyo-e: images of a floating world. Landscape painting was still the preferred medium of the nobility and upper classes. Woodblock artists had always produced copies of famous paintings even before the Edo Period, but by the late 18th century landscape prints were out of fashion. Hiroshige continued, in woodblock prints, the great tradition of Chinese and Japanese landscape. The gifted pupil of Toyohiro, he achieved his master’s status at the age of fifteen. Hiroshige produced prints of urban beauties (bijin) and Kabuki actors until 1823 when Hokusai’s landscape series Thirty-six Views of Mount Fuji was first published. This influenced Hiroshige to produce Famous Views of the Eastern Capital in 1826, and thereafter to focus on landscapes. His most famous series, of course, was the Fifty-three Stations of the Tokaido for which he produced the sketches starting in 1830. This print comes from a series commissioned by the poet Taihaido, whose literati circle wanted their poems immortalized as prints depicting scenes of the subjects of their verses. The upper part of this scene bears the three or four line verse of the poem. Mount Asuka is the lowest mountain in Tokyo. It also appears as a subject in Hiroshige’s own series Thirty-six Views of Mount Fuji published in 1852. This print is unusual in that instead of using the white of the paper, Hiroshige appears to have used lead white for the snow flakes. They have subsequently turned black from chemical decomposition in many versions of the print. This is an awesome website about Hiroshige’s landscape series.